Scorecard for Sugar® SugarCRM, Inc.
Scorecard is a framework that allows you to find the quick hits that will empower you to more easily achieve your goals. If necessary, there is also an option for multiple data sets and scorecards. 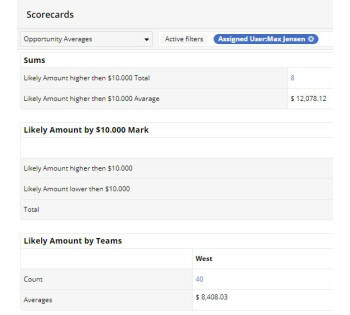 Filters that are added to Scorecard will automatically update, with new data points taken straight from the data sets being observed. Scorecard for Sugar® can be fully customized to your liking, including custom views, custom filters, and data sets. Scorecard can pull in multiple data sources and intersect them to get a completely new data set that you would not be able to get using a default reporting module. Support You Can Count On Scorecard is maintained by Intelestream, so it’s backed by one of the best support teams in the SugarCRM community. Interested in seeing a demo about the ways Scorecard can benefit your company? Contact us via Intelestream.net, or call us at 800.391.4055.